Gartner is estimating that there will be 13 million enterprise tablet purchases next year, and 53 million by 2016. They predict that Windows 8 will grab 39 percent of the tablet market in 2016. You can be sure that you’ll have many users wanting to run your Clarion apps on their (Win8 Pro – x86 based) tablet. And with the release of Clarion 9 you’ll be ready to deliver to them because the release of version 9 will add full touch support to the Clarion RTL. And any time a user swipes, taps, clicks, pinches, stretches or and zooms the screen with a finger, when they release it an event (EVENT:Pointer) will fire. The RTL retrieves the pointer info, ID, flags, and coordinates that were touched. The PROP:PointerInterface allows you to specify your own optional handler of pointer events. 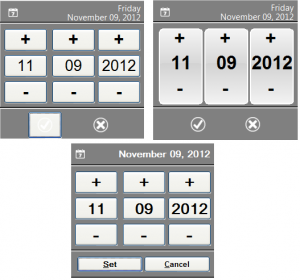 So how do you go about adding Touch support to a Clarion app? Clarion developers won’t need to manually add any code to support touch. The C9 Templates will generate all the code needed to respond to touch gestures, so existing Apps will just need a regenerate with C9 to become touch-enabled. Touch-friendly sized buttons, menubars, etc. As an example of touch-friendly design here are screen shots 3 new touch-friendly Date pickers that are already completed. There are also some touch behavior considerations that have to be worked out. With the input from the Clarion developer community we’ll be working on defining Browse/List behaviors, and behaviors for other controls and Template types during the beta phase of C9. Its very likely that we’ll make the behaviors Global Template settings so that you have final control as to how your application responds to touch gestures.